Wednesday's Walk down Memory Lane has become such a joy for me to write. I want to thank Lynnette of Dancing Barefoot ...on Weathered Ground for creating this meme. There have been a few special benefits of joining in these Wednesday's Walks. 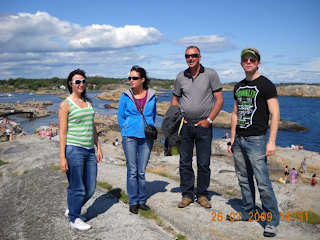 I actually found some new relatives on my father's side of the family after writing a post about my Grandpa Sumstad. My niece Katie started reading these Wednesday posts because she's learning more about our family history. I've made some new blogging buddies. I've had fun searching through old family photos (more to come). 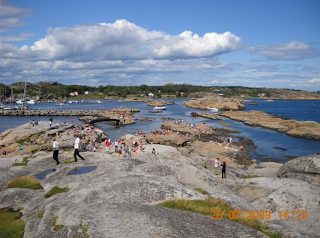 So, for this Wednesday's Walk, I wanted to share a few photos I received from a new relative in Norway. Ogee found his way to Heart Choices through another new relative named Bill Sumstad who lives in the Seattle area of the US. 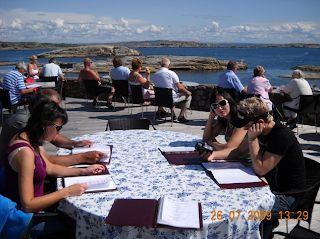 Ogee wrote to me and told me that he was born and raised in Roan, which is next to Sumstad in northern Norway. His father's mother was my Grandpa's father's sister. Does that make sense? I think I need a diagram. LOL. 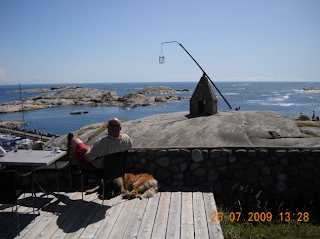 Ogee has been kind enough to send me some photos of that area of Norway. Looks like a great place to sit and relax. Take a look at the dog lying down. I'm sure my own Dad would love this, right Pop? Not a bad place to eat! 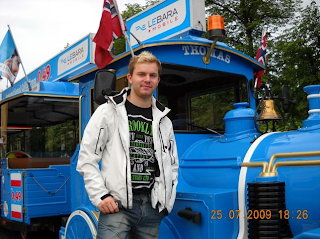 I had to l augh because Thomas lives in Norway but he's wearing a T-shirt that says Brooklyn. My niece Katie lives in Brooklyn, New York. I'm not sure what the relation is but Thomas must a second cousin or something like that. I want to thank my new cousin Ogee for the great photos he shared with me. I love how the internet has brought people together. We often only hear about the bad aspects but it can be used for such good too. 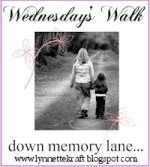 Happy Wednesday and don't forget to visit Lynnette for more posts on Wednesday's Walk down Memory Lane. Norway has certain rules about naming children. Names have to be already in the language or the person's own cultural history before it is allowed. This is a great idea for a post for me...lol. Thanks for the read - I love learning about Norway. That is really cool! Only God could bring a relative or a few into your life through blogging! I know I've shared this with you before when you had a plate showing that said Ye Elska Deg...but my step mother's father (we called him Gee Gee) came from Norway but jumped off a ship at the age of 14 and came to America! He ended up somewhere along the New Jersey shore and then eventually met my grandmother and they moved to Florida. It just amazes me that he was so young! He always kept his thick Norwegian accent and always had a smile. And he always told us kids Ye Elska Deg which as you know means I love you! Big hugs to you today, sweet sister! Wow Debbie. This is terrific. I'll have to check out the Wednesday's Walk meme. The pictures are beautiful. I want to go to Norway. What a great way to be able to connect with relatives and distant relatives! Those pictures are beautiful. I don't think I ever saw pictures of Norway before. oh, that's very nice, Debbie:D the place looked very peaceful and so pretty. I'm happy that you had found great connection through Internet with your long-distance relatives. That's really awesome! I think it's just amazing how GOD uses tools to bring people together like the Internet. Look at how your family has opened up and expanded. Awesome. Beautiful photos! That view was amazing! Debbie, I think it is such fun to read about your new found relatives in Norway. The pictures were so colorful and pretty. It looks beautiful there. This sure is a beautiful world that the Creator gave us! So glad you joined in today for Wednesday's Walk. Enjoyed this pictures loved "traveling" with you today. Isn't that awesome? I too was found by a distant relative (my husband's actually) via the internet and it has been wonderful getting to know him. Norway looks beautiful! These photos are wonderful. Debbie,I hope you get to go to Norway and visit your relatives. I love reading about your family, such a rich heritage. I'd love to visit Norway. Great pictures. ...to learn more about relatives and places...the internet really has made the world a little bit smaller. blue sky and blue sea and lts of happy relatives. I hope you some day will be able to visit Norway once more. We just had a cousin staying for some days. We mutually agreed that this unique gift of sharing common roots and history, simply cannot be praised highly enough. When the Lord closes a door, he opens a window. If you were out traveling, you would not have time to find this treasure on the internet.God bless you and yours.